Playing here offers White a simple counter to , in cases where the important ladder is bad for Black. Black can play confidently at a in cases where the ladder (see below) is favorable. If not, Black at a is somewhat less attractive, and Black will also look at the plays at b and at c.
This is the key line: it might turn out to the advantage of either player. Now Black at a or at b. In this case is what Black wants to play (as a double-purpose move: in order to threaten with a ladder capture while also threatening with isolation by playing at the circled point. This actual result isn't so common in pro games, since White will try to avoid it. White will play and assumes the good ladder. 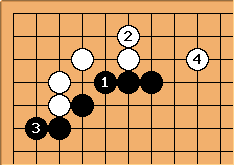 White now has some ladder aji to exploit; Black will complete the capture shortly, and then White will consider expanding the corner at a. Black is guaranteed good thickness in this line. ... then this is seen in pro games. is a kind of tesuji based on , because Black doesn't have a good atari play now. 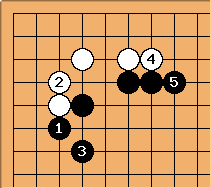 For alternative play by White, see Joseki Dictionary Coverage Depth. This is therefore a tough fight for Black. It has gone well beyond the idea that Black plays a cover and White has to play somewhat passively. When is played in reply to , is a standard idea, before pushing once more at the circled point (which is after all pushing from behind). 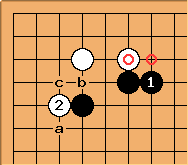 At this point any of a, b or c can be played by Black, according to current pro practice. At there are several variations. In this one White will take sente after . This is another way to play for Black, taking sente - at a cost, naturally. Playing and is currently fashionable. What now for White? 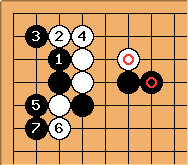 Usually is played, provoking this sequence. Black has sente, but White's corner isn't small. This is known only in Korean games. Black is hoping for an improved version of the hanedashi variation. 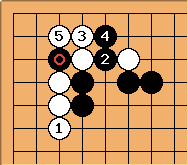 After these plays it has reached a position from that joseki, but with the / exchange in place. What follows is on similar lines. This too is being played currently by the pros. These are the common moves that follow. White can take sente at this point. Here is another line which is even more rare. See also 4-5 point 4-3 approach keima, contact at 6-3, vulgar cut.